An Eagle Scout is the highest advancement rank in Boy Scouting. The rank of Eagle Scout carries with it a special significance, not only in Scouting but also throughout a Scout's life as he enters higher education and his chosen career path. The rank stays with the young man for life. 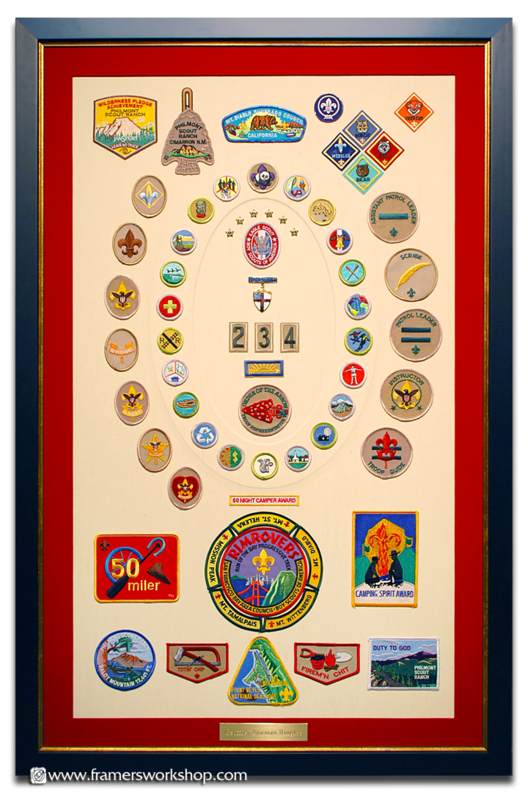 This framed collection honors the journey of one Scout from Bobcat to Cub Scout to Boy Scout and on to Eagle. This accomplishment takes years to achieve. Although we at The Framer's Workshop certainly recognize that National BSA policies need further progress in the area of nondiscrimination, it is a great personal achievement for any young man to earn this rank, and we congratulate all Scouts who work so hard to earn this lifetime honor.